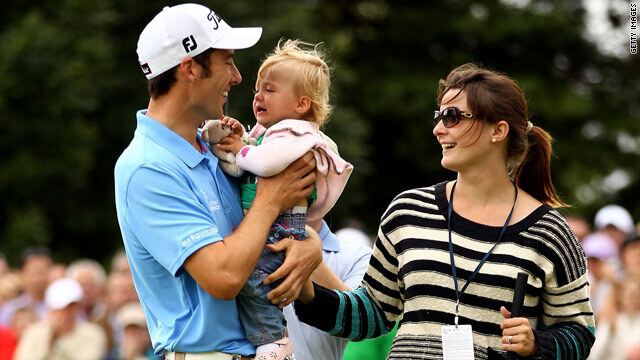 Ross Fisher celebrates with his wife and young daughter after winning the Irish Open in Killarney on Sunday. (CNN) -- English golfer Ross Fisher boosted his Ryder Cup hopes by claiming his fourth European Tour title with a two-shot victory from home hope Padraig Harrington at the Irish Open on Sunday. The 29-year-old jumped up to sixth place in the European team standings ahead of October's clash with the United States as he equaled the tournament record score of 18-under-par 266 in Killarney. Europe captain Colin Montgomerie set that mark nine years ago, but the 47-year-old has not played since finishing 68th at the British Open last month. Fisher had led by three shots at halfway after a 10-under 61 on Friday, but saw that cut to one stroke by compatriot Chris Wood and Italy's Francesco Molinari after a 71 on Saturday. The world No. 36 started his final round badly with a bogey at the third hole, but bounced back with five birdies and an eagle at the par-five seventh to card 65. That proved enough to deny three-time major champion Harrington his second title in four years at his home event, despite a flawless 64 including an eagle at the par-five 16th. "It just feels great to come out on top against such a world-class field," Fisher told the European Tour website after claiming the $650,000 first prize. "I could hear the roars and knew Padraig was making a charge. I just tried to stay patient and this is what we play for -- we want to give ourselves a chance and I am no different." Wood held on for a tie for third after a closing 68 which featured six birdies and three bogeys, joining Gonzalo Fernandez-Castano on 270 after the Spaniard shot a flawless 67. England's Richard Bland (65) was tied with Australian Richard Green (67)another shot back, while Molinari was eighth on 274 after an erratic 72 containing four birdies, four bogeys and a double. Meanwhile, American Jeff Overton took a three-shot lead into Sunday's final round of the Greenbrier Classic in West Virginia as he seeks his first PGA Tour title following two runner-up finishes this year. He had been four ahead at the halfway stage, but two early bogeys saw that cut before he bounced back with five birdies in six holes from the 12th for a four-under 66. His compatriot D.A. Points moved up to second place on 15 under with a superb 61, while U.S. Ryder Cup player J.B. Holmes went one shot better to be in a four-way tie for fourth on 12 under -- one behind Boo Weekley (67).